Guys, I’ve been researching and I believe JFK Jr. is alive. Trump helped him hide from the cabal. 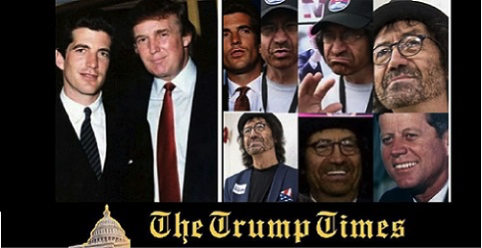 He, dressed as Vincent Fusca, his wife, and his wife’s sister have all been to Trump rallies. What’s more, Caroline (his sister) and her son who looks like Jr. were at one rally. Always VIP seats. Allways directly behind POTUS. When is the last time you saw a Kennedy at a republican rally? Vincent Fusca=Conqueror of Darkness. I believe he is on the Q team. There is a team of anons investigating just Jr. They believe that he and Ed Snowden have spoken directly to them. When at one of the rallies Fusca/Jr. is holding one of those pink Women for Trump signs. Written in magic marker one of the anons (kelliannhubnews) noticed Ruby Cute. Further examination revealed that Ruby Cute is a file belonging to Edward Snowden. (Evidence perhaps). He, Jr. will unite the country, and he will be POTUS come 2024.